After a torrid run from its bottom, crude oil has settled into the tightest range we've seen in a year. But according to one highly regarded technician, the commodity is heading into a key inflection point. 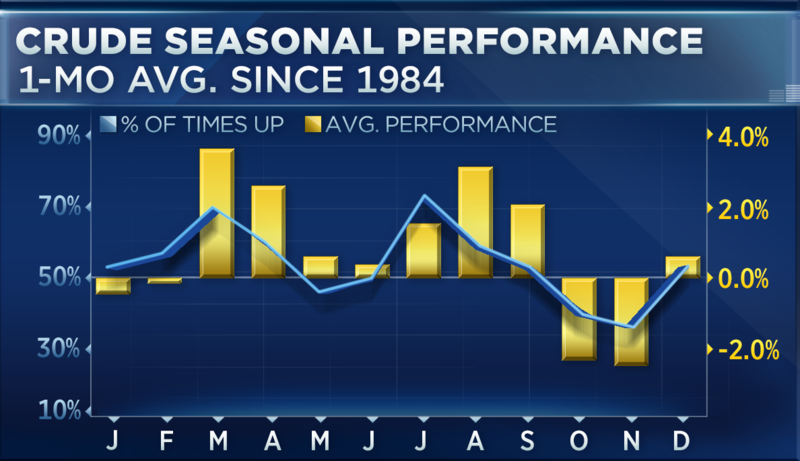 "If you look back to 1984, you see that [the summer months] are some of the best times of the year to be invested in oil," technical analyst Ari Wald said Tuesday on CNBC's "Futures Now." Wald noted that traditionally, the time between July and September tend to be the three best-performing consecutive months for oil in the past 30 years. By his chart work, oil has rallied an average of 1.5 percent in the month of July, 3 percent in August and 2 percent in September. And while he does see the potential for oil to trade as high as $67 a barrel in the near term, he noted some troubling signs on the chart that tells him the primary trend for oil remains lower. "We have a falling 200-day moving average which indicates that the trend is still down," said Wald, head of technical analysis at Oppenheimer. "There's also a very important retracement level for oil going back to last year. And I think that's going to curb the upside." According to Wald, once the seasonality fades the oil decline could resume, sending the commodity back into the $40 range. "Investors should trade in the direction of the trend," he advised. "I think a test of the lows that we saw earlier this year is not without question." But Wald stressed that trouble for crude does not necessarily mean the pain could hit the equity market. "Historically, these range-bound commodity markets have been very good for stocks," he said. "If you look back at the ranges for commodities back in the '50s, '60s, '80s and '90s, they coincide with the secular bull markets in the S&P 500."